The devastating Camp fire in California that raged in November of 2018 has left more than 70 people dead and more than 1,000 people missing. In Butte county, the Camp fire has destroyed 12,784 structures, including 9,891 homes (Holpuch & Anguiano 2018). The emotional and physical stress these large wildfires put on residents of burned areas is unimaginable. Lilly Batres, a 13 year old resident of Magalia, a town affected by the California Camp wildfire, was evacuated to a shelter nearby. Lilly doesn’t know whether her home is still standing and while she seeks refuge at a camp, she cannot grieve in privacy. To Lilly, the camp is “cold and scary”, and even to some extent she feels like “people are going to come into our tent,” she explains (Anguiano 2018). The Camp Fire is not the only fire that has burned massive plots of land in 2018. The Carr and Ferguson fires in California, burning more than 80,000 hectares, and in Oregon and Colorado have orched more than 100,000 hectares collectively (Selby 2018). Due to the effects of climate change, the United States will be be impacted by more frequent and intense wildfires, especially in sensitive regions of the western United States. In California, many fire prone areas exist in the wildland-urban interface (WUI). The National Wildfire Coordinating Group defines the WUI as the location where housing developments are adjacent to undeveloped wildlands or vegetative fuels. In 2013, the US Forest Service published a report stating that from 1990 to 2000, more than “1 million homes were added to WUI in California, Oregon, and Washington combined” and that about 32% percent of U.S. homes are located in the wildland-urban interface. Within the wildlands across the United States, the US Forest Service has also noted that fires serves an ecological purpose in 94% of these ecosystems (Stein, et al., 2013). One Californian WUI was in Kern River Valley, where a wildfire kept burning even after 22 million dollars was spent to suppress it. The Kern River Valley fire burned 200 square kilometers, killed two people and destroyed 285 homes (Inskeep 2017). Wildfires have always been apart of the natural cycle of wildlands. Low intensity fires have managed landscapes before human intervention stopped these smaller wildfires from occurring (Stein et al., 2013). This means that wildfires will be likely to happen in these areas, which creates a case of concern for millions of Americans who are living in WUI. Since the 1980s there has been a consistent growing trend in the amount of wildfires, length of fire season, and size. These trends will continue for the foreseeable future due to human caused climate change (Ingraham 2018). This growing threat of wildfires in the United States has become a popular topic in recent media. The discussion has even reached President Donald Trump’s pulpit who in a tweet has pointed to faulty management practices as the culprit for the wildfires (@realDonaldTrump 2018). When asked about what role climate changed played in this most recent wildfire, “[Donald] Trump said he thought there were ‘a lot of factors’”(Tatum 2018). Donald Trump represents a faction of climate change deniers, who have pointed to factors other than climate change for the reasoning behind more frequent and intense wildfires in the United States. Wildfires prevail due to dry conditions which is caused by a combination of increased temperature and a decrease in precipitation. These dry conditions are especially concerning in the western part of the United States, a reduction of rainfall and increase in temperature has occured in recent decades through weather station data (Jain,Wang, & Flannigan, 2017). Spring and summer precipitation conditions have a significant impact on wildfire risk when they are drier. The lack of precipitation results in an increased chance of wildfires due to easily flammable timber because dry vegetation easily ignites, especially during summer thunderstorms (An, Gan, & Cho, 2015). A drop in precipitation rate causes the humidity to drop and reduce moisture in the air, allowing plants and shrubbery to become dry and stay dry for extended amounts of time (Liu, Goodrick, & Stanturf, 2013). This increases the chances of a wildfire starting. The most active and severe wildfire season because the dry periods of the summer are worsening over time causing wildfires to be more likely to ignite and become more intense through dry vegetation leading to more damage to the environment and urban communities (An et al. 2015). The increased drought and changes in humidity in recent decades will only continue leading to the fire potential increase. Before the turn of the 21st century the proportion of forest sites in California burned due to dry weather were relatively lower due to the summer seasons containing more rainfall at about 40%. After the year 2000, the total burn area in these same forest sites increased to about 70% (Stevens‐Rumann, Kemp, Higuera, Harvey, Rother, Donato, Lloret, 2018 pg. 248). This is huge for just a matter of a few decades. California is experiencing severe wildfires that have spread across the state due to extended and heightened dry season. The number of fires during August 2012 in california was 6,948, ranking second least for the years between 2001-2011. In August of 2012, 1.47 million hectares of forest burned, reaching the largest yearly average ever recorded at a 211.8 hectares per fire. This means that sheer number fires are decreasing because the size and intensity of fires are severely increasing to new records. The ten-year average fire size between 2001 and 2011 was 83.2 hectares per fire (Luo, Tang, Zhong, Bian, & Heilman, 2013). That is an average fire size increase of 128.6 hectares for one decade. Increasing drought seasons give way to dry lands that make fire ignition easier, leaving a higher frequency of wildfires. These dry conditions lengthen because of longer periods of summer conditions and drought lengths, increasing the fire season. The length of a fire season will increase by 1 to 3 months (Liu et al. 2013) The longer a warm and dry season lasts means less moisture in the landscape this makes thunderstorm able to cause a wildfire that spread quickly due to dry flammable bush. In the Northwest United States, the temperature is increasing by nearly 4% in the summers and 2% in the fall, winter, and spring, annually. Increasing local average temperature is a driving force of current and future dry conditions (Liu et al. 2013). Generally increasing trends of climate over the present period, indicates that the impacts of global warming on fire for the Western U.S. is directly linked to fire intensity and severity (Liu et al. 2013). Intensity relates to the size of the fire and Droughts can cause drier vegetation in forests that help fuel wildfires causing wildfire spread at a quicker rate. Through previous observations, this leads to the local shrubbery in forests to dry out causing for more fuel for fires to carry over larger areas (Littell, McKenzie, Wan, & Cushman, 2018). Sources agree that wildfire threat varies across regions in the United States with the consensus that the frequency of yearly mean fires will increase in association with a warmer, drier climate. Mathematical modeling has a projected annual increase in Very Large Fire Potential (VFL P). The Western Cordillera region of the United States, which includes almost all of the area of the California WUI, shows a >300% increase in VLF P related to climate change (Barbero, Abatzoglou, Larkin, Kolden, & Stocks, 2015, p. 895). Various sources agree that there is an increase in very large fires (VLF), the defined size of a very large fire is disputed among articles ranging from >400 hectares (West et al., 2016), >5000 hectares (Barbero et al., 2015) or >8,500 hectares (Hurteau, Westerling, Wiedinmyer, & Bryant, 2014). Even with the dispute in VLF size, the central message is clear that no matter the size, climate change is going to increase the destructive area of wildfires. Models have shown that an increase in temperature can cause a tipping point, which is when Climate fire projections switch from increasing to decreasing, in fire occurrence and severity due to changes in mean temperature and mean precipitation overall. The tipping point would be caused by a drastic change or shift in vegetation (fuels) due to droughts leading to a consistent increase in size and frequency of wildfires (Stambaugh et al. 2018). The tipping point would be caused by a drastic change or shift in vegetation (fuels) due to droughts (Stambaugh et al. 2018). Vegetation conditions greatly influence whether a wildfire grows and spreads. A study of wildfire land management in Illilouette Creek Basin (ICB) of Yosemite National Park in the Sierra Nevada, California shows how vegetation greatly affects the likelihood of increased severity in wildfires. Through using the vegetation to human advantage, wildfires can be somewhat monitored and controlled. Having vegetation placed strategically and in patch-like characteristics help manage wildfires in an area (Boisramé, Thompson, Kelly, Cavalli, Wilkin, and Stephens. 2017). The use of vegetation to help prevent the severity of wildfires is a great technique to manipulate fires for human advantage. This shows that landscape management is just as important, if not more, than suppression. Many residents say the view brought them to Kern River Valley and this is probably true for many places in the U.S that reside in the WUI. A man who was affected by the Kern River Valley fire is Fred Roach, a long term resident of the neighborhood, and a retired Forest Service firefighter. Fred completely fire proofed his home and the results were amazing. His house was seemingly untouched by the fire, almost as if there had never been one in the area. A picture of Fred’s house shows his house in perfect condition and across the street is a completely burned and destroyed property (Inskeep 2017). Fred Roach is solid evidence that the average homeowner can fireproof there home and protect it, preventing young girls like lily from not knowing if her home is still standing after a wildfire. With many homes being built in WUI’s we need to start looking at ways that we can fireproof homes so that the damage of the fires is mitigated. Jack Cohen, a United States Forest Service Fire Scientist states, “Most of the houses I’ve examined very likely ignited from small spot ignitions on or adjacent to the home — not from the big crown fire flames. That means a homeowner can easily do fuel reductions that can potentially save their homes” (Inskeep, 2017). Homeowners living in WUI zones are more at risk from fire destruction when having no fire resistant modifications to their homes. Making changes to the outside of their homes and they yards or surrounding lands can be inexpensive and highly effective. Since wildfires have hit California the largest fire burned area in Redding has put “more than 5,000 structures” at risk of burning, leading to “517 structures destroyed and another 135 damaged” (Associated Press 2018). With tons of homes being affected by wildfires and with the risk of wildfires increasing due to climate change we will only see the number of structures at risk and burnt only increase as well. Since families keep moving into the WUI zone, the only thing we can change is how these families build their homes to avoid the risk of completely losing the structure. One way that people that live in the WUI can help fire proof their homes is by avoiding cracks and openings on the roofs of homes that used Spanish tile roofs. They could build roofs that use “tiles or other fire rated roofing materials that are designed to interlock tightly” and put these over a fire resistant cap sheet(Milne 2017). Using an interlock roof doesn’t allow for fires to be able to sneak in through the tiles and then attacking the wood framing underneath. With the fire resistant cap sheet underneath interlocked tiles, even if the fire does somehow get through the roof, the cap sheet will allow for a secondary barrier to fires protecting the interior of the house. Another way they can better protect homes from the wildfires is installing fire resistant windows. Many homes have been built using single glazing windows which is very prone to shattering even from radiant heat alone causing the fire to be able to reach the interior of the house. The better option that people can use when building houses is installing “double glazing with tempered glass on the exterior” (Milne 2017). The tempered glass is processed by controlled thermal and chemical treatments to allow the glass to strengthen and be able to withstand high temperatures. Even if the glass does fail, it doesn’t shatter like single glazed windows, but instead it crumbles “into small, relatively harmless pieces” that allows the glass to still stay standing rather than shatter and fall (Architects V. 2017). Using these methods can help prevent your house from experiencing more damage from fires and allowing people that live in these WUI’s to help preserve their house. One architect took on a project that was meant to be built in a high risk area of wildfires in California. Abeer Sweis used many of the methods stated above and designed the home to be fire resistant. 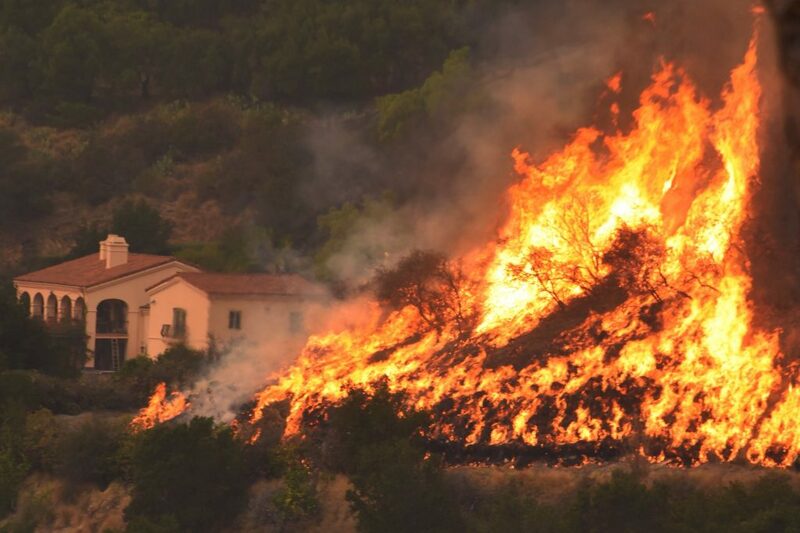 Later on in the year when the community of Ojai was hit by a wildfire “that claimed 1,063 homes and other structures. It survived.” (Woodyard 2018). If all the homes in California are built to be fire resistant we can see the damages of the wildfires greatly reduce and the homes of many families can be saved. One way that we can make sure that people that live in these areas are using the methods stated above is by changing the building codes involved around building in these areas. This will ensure that the contractors and architects are taking the precautionary measures to ensure that the houses are all up to the fire proofing code allowing for all the houses to be preserved rather than completely burnt down year after year when there are wildfires occurring. When looking at the building codes in relation to fire proofing houses, the codes are strict and straight forward. In section 703.3 of the Fire-resistance-rated construction, it states that materials and devices that have not been proven to show how they help reduce fire must have sufficient data to show to a building official to be used properly within code laws. (CITE) For new homes this standard is already met due to the fact that new homes must be built to code. This means the method of construction is designed to minimize the risk of fire. Everything from walls and appliances to splices within electrical work, the entire structures’ purpose when following the fire-resistance codes is to keep the potential damages small. For homes that are grandfathered meaning built before the fire-rated codes were in existence, considering that the house isn’t built to the current code standards, renovation improvements would significantly help the structure. Surrounding landscapes of homes should be maintained properly to reassure that nearby fires do not reach the house. There are multiple ways to protect homes, from large scale tree removal to what kind of bark mulch to use for garden beds. Knowing that radiant heat from burning trees can ignite nearby shrubs, trees and structures the significance of trimming and strategically planting vegetation is at the highest concern to ensure the house survives. (Milne 2017) For homeowners this is a simple and feasible defensive method to keep fires away from the house by understanding the concept of strategically laying out the vegetation landscape. Previously existing or planted trees provide the highest risk for spreading fires that lead to houses becoming engulfed in flames. Trees should be spaced out by at least 3 meters between the edges of tree crowns. As they grow, thinning out the tree is needed in order to maintain the proper spacing to defend the fires. (Dennis 2018) When using mulch it’s imperative to use proper fire proofed mulch because when exposed to fire they tend to smolder and are difficult to extinguish. Mulches that are made up of bark chips, pine needles, or straw shouldn’t be used because it’s possible it might carry to the fire to the house. (Dennis 2018) As a result of replacing the mulch every couple of years, a more affordable solution to the mulch would using river rocks for landscape decor. River rocks do not decompose like the mulch does and only require periodic washing to stay appealing. (Palmer 2018) Since landscaping surrounding a house is affordable it should be properly thought out and maintained to give homeowners the best chance at stopping wildfires from reaching the house. We see proof of this from the U.S Forest Service lab in Missoula, Montana, ember test on fire proof homes have shown to be very effective (Inskeep 2017). In Kern County, defensible space of 30 meters of clearing is required, homes that implemented this practiced showed much less damage of those that did not (Inskeep 2017). As a result, residents of WUI and fire prone communities should fire proof their homes and bring these issues to their local and state government’s attention. Climate change is evident and we must adapt to it, we have to better prepare ourselves for the increased dry seasons and decrease in precipitation. There are clearly different views on how the federal budget should be allocated. Changing the way America builds WUI communities can reduce economic losses and fatalities through fire proofing homes and the area surround homes.